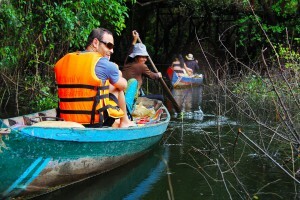 Everyone is on a journey. You have given them a destination. Whether this is your first time considering an online reservation system or you are taking a look around the market to see what else is out there, we at InfoTree get that you are a busy business owner looking for the right fit for you. If we think your business will not work with our system, we will be up front with you and not let you be disappointed down the line. That is our guarantee. The best way to learn about AttractionSuite is to see a live demo with one of our team members. But we understand that you might want an introduction. Look no further. This quick overview will get your feet wet and then you can still check out our Features page. AttractionSuite has two sides to it. clean and uncluttered. Customers can select their date, time and categories before proceeding to checkout. Display your terms and conditions to ensure understanding of the purchase. Your customers receive an online confirmation with a full breakdown of their purchase. They can receive their tickets as attachments and print them for check-in. You can also automatically attach any waiver forms or directions for your customers to use. The online calendar never sleeps. Your customers will find the process short and sweet, while you simply watch the transactions take place on their own. In-house is where you have all the control. Matching your online calendar, you can see your schedule laid out and which times have sold and how many. From this page alone, you have many options. Block out a date or change the inventory for a single event if need be. You can make a reservation over the phone and put it into the system with or without payment. Change the departure time to match the sunrise or sunset. Print a manifest report and view reservations already made. 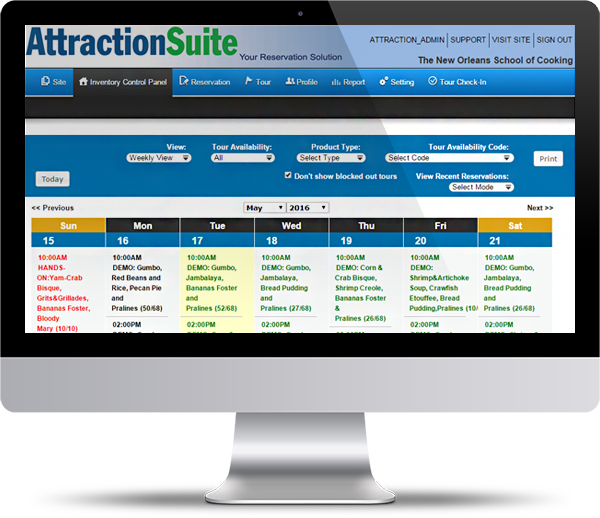 These are just some of the amazing features offered in the AttractionSuite software system. We should also add that we can put all of your information in the system for you in a matter of days. We will also train you to use the software and have a support team available for all your changing needs. Check out the rest of the details on the Features page.